In 1298 William le Lou occurs as a juror at Newcastle (West), Co. Limerick. This first reference to the surname in Limerick shows that the later West Limerick Woulfes were true Woulfes and not Ulfs. Newcastle was a manor of the Shanid Geraldines. In 1308 the head of that family, John fitz Thomas, had as his receiver in Oconyl one William Wolf, probably the same man who occurs ten years earlier as le Lou as it is around this time the general switch from the French to English style occurs in Irish documents. Oconyl was a general term for the western third of Limerick, all of which lay in the lordship of the Shanid Geraldines, the ancestors to the later FitzGerald earls of Desmond. Three years later we find a non-specific reference to a Thomas Wolf in Co. Limerick and then have to wait until 1359 when another "Thomas Wolf of Ardagh" was appointed a collector for a tax subsidy being raised in Co. Limerick. 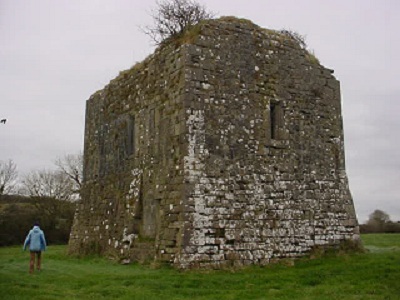 Could this 14th century castle in Ardagh have been Thomas' base of operations? It's located on Frank Woulfe's farm just outside town. Then, in 1375, we note the appointment of Thomas Ulfe as parliamentary collector for the cantred of Ardagh. This latter reference is certainly a scribal mistake for Wolf. Each county had its own clerks and here a Limerick clerk was confusing the very prominent Ulf with the less conspicuous Wolf. Finally, in 1420 a west Limerick jury was empanelled to extend the Desmond lands there, among the jurors being Patrick Wolff. No further trace of the family can be found until the 16th century, when we find the family prominent in the Rathkeale area and at nearby Croagh. What is strange here is that these places lie in the cantred of Iniskifty, a territory only acquired by the first Earl of Desmond around the 1330s. The explanation here may be that the early Woulfes moved to Rathkeale *See Wolfesburgess of Rathkeale below* while still in the employ of the Geraldines or that the Rathkeale Woulfes were an offshoot of the earlier Wolfs of Ardagh, where we do not find the name present later. The pattern of landholding of the Rathkeale family, essentially holding lands in the burgagery of an incorporated borough, i.e. as wealthy townsmen rather than as country knights, is indicative of an origin as officials of a wealthy lord, just as the earlier family are known to have been. In 1573 pardons were issued by the English administration to hundreds of followers of the last Earl of Desmond, then engaged in a last desperate effort to keep the English out of Munster. Among those pardoned were Patragin Wolf of Williamstown, Horseman, and Edmund Wolf of the same place, Footman. This is modern Ballywilliam near Rathkeale while the rank of horseman was close to that of gentleman, footman being a lessor one. Patragin represents the Irish Padraigín, "little Patrick". This seems to refer to the family head, Patrick Wolf, who, on July 12, 1580, in Co. Limerick, was one of those attainted as rebels for joining the last Earl's forces, where he was killed fighting the English. His elderly father, John Wolf, who must have settled his lands on his son before the latter's death, in July of 1584 mortgaged the lands of Balywinteryework to Rory McSheehy of Ballyallinan for 53 milch cows. At this time Patrick's lands were extended as "Gortnemonymore, Nahakrye, Farranaglon, 50 acres, the two and a half quarters of Ballywilliam, the 60 acres of Enyskoysh**, all part of Rathkeale". From another quarter we learn that Patrick possessed the half-quarter of Ballywolane and the ten acres of Russell's Burgages, both in Croagh. Croagh was another Anglo-Norman borough and lies about four miles east of Rathkeale. Ballywolane is, of course, the present Milltown in that parish. Yet another source adds "Clonlegan and Krynashellagh". These lands can be identified with the modern townlands of Ballywinterourke, Ballywilliam South, Ballywilliam North and Ballywilliam Demesne, and Enniscoush in Rathkeale parish, while the first three denominations must be the present Wolfesburgess East and Wolfesburgess West, which straddle the town of Rathkeale at either end. The Croagh lands may be identified with Ballylin and part of Croagh itself. The acreage suggested by these lands is around 2,200 acres, a modest estate, most of which lay around the town of Rathkeale itself, of which the Wolfes must have been the leading family. **remember this name. This shows that Woulfes were living in this area also known as "Inniscuais." (pronounced Innis-koosh) One Woulfe fleeing the seige of Limerick city came here first before taking lands in the Athea area. There are actually 2 townlands named Wolfesburgess. Wolfesburgess east and west in the Parish of Rathkeale. Burgess is basically another way of saying Borough. Rathkeale is a very old Irish settlement, first mentioned in documents in 903. Patrick says the English made Rathkeale and many more settlements in the area they initially conquered "Boroughs" to attract settlement in Ireland among the Anglo-Normans. There is a reference to Wolfesburgess in the Elizabethan plantation and that it records the land as belonging to a Sir Patrick Woulfe who dies in rebellion. This Wolfesburgess spelling is another matter to add to the confusion. In the same graveyards, you will find a "Wolfe" gravestone right in the middle of many "Woulfe" gravestones. If they were in a different part of the graveyard, I'd suspect they might be a different family, but as they're right in among the Woulfes, I suspect some folks just had different ideas of how to spell their name. The townlands definately take their names from the "Woulfe" name. This suggests that this is among the areas the family settled in after coming to Co. Limerick. With the plantation the family would have found it much more difficult to re-establish the claim if they recognised the settlement and continued to live on land that was formerly theirs. The result was that they would have sought refuge elsewhere. One of the families awarded land from the plantation were an English Catholic family called Courtney. They had approximately 30,000 acres in West Limerick and there is considerable evidence to indicate that they provided refuge to a large number of displaced Irish families on their Co. Limerick estates. They certainly owned Athea up to the 1820's. As the Woulfes here had lost their lands after 1588 there is no further record of them as landowners, but they certainly remained in the area as tenants of the New English landowners, as evidenced by the Patrick Woolf who held 50 acres of the Earl of Cork at Moneregan near Rathkeale in 1630. As dispossessed landowners the family hardly occur in records of the period of "The Hidden Ireland". The only significant 18th century reference is to that of the will of Francis Woulfe of Askeaton, a merchant, who died in 1730. The surname expert, McLysaght, gives Nix as an early interchangeable form of Woulfe in West Limerick and derives this from MacNiocais, presumably from a corruption of "son of Nicholas". Strangely, about 15 households of this surname can be found in 19th century Clare and Tipperary but none in Limerick, so he may be wrong here. Whatever of this, it is certain that Woulfes continued to flourish in West Limerick down to the present day, as more Woulfes/Wolfes can be found here than anywhere else in Ireland today. Probably the best know of these was Fr. Patrick Woulfe (1872-1933) or, as he preferred to be known, An tAthair Pádraig de Bhulbh, born in Cratloe to Seamus Woulfe, a farmer. (A James Woulfe of Cratloe made a will in 1831). Fr. Pádraig was the author of the first major work on Irish surnames, his famous Sloinnte Gaedhal is Gall, published in 1923. De Bhulbh also published extensively on local history topics. Ulf is not a nickname like le Lou but a patronym, i.e. the christian name of a direct ancestor. It derives from the Anglo-Saxon ulf or the Scandinavian ulfr, both meaning Wolf. Therefore the first Limerick Ulf was either of native English or Danish (Viking) settler descent. The modern form in England is Ulph. The only substantial family of the surname to be found in 14th century England were located in Lincolnshire. The first reference to the name in Ireland occurs in Wexford in a charter of around 1177, witnessed by one "Elias son of Ulf". While the father of this man may well be the ancestor to the Limerick Ulfs we cannot prove this. The lands in Carrickittle manor are of especial interest to us. Carrickittle lies just south of the ancient manor of Grene, which gives its name to the cantred in which both are situate. In 1300 Philip Ulf gave pledge for a wrongdoer in Grean while in 1314 we read that "the haggard of Sir Philip Ulf at the Oldton near Grene was burned by Richard de Burgh". This is the only actual reference we have to a probable residence of Ulf's. The manor of Carrickittle seems to have consisted of the parishes of Kilteely and Aglishcormack, perhaps with small associated parts of the neighbouring manors of Grene and Caherconlish. In the latter parish is located the townland of Ballyphilip, which lies just 1½ miles west of the town of Pallasgrean, the modern successor to the ancient town of Grene. Very significantly, the mercantile Woulfe family of Limerick City, in a pedigree composed in the early 17th century and based on old family records, give this very Ballyphilip as the residence of their earliest known ancestor, Thomas Woulfe, who was an adult about 1450. It would seem from this that the residence of Sir Philip Ulf descended via Nicholas Ulf to his descendant, Thomas Woulfe, in a direct line. Just as intriguingly, bearing in mind that many townland names actually originate in the 13th-14th century period, does Ballyphilip ("Philip's home") actually commemorate Sir Philip Ulf? This James is described as a merchant of Limerick and of Corbally, (now Longstone, Grean Parish). As one of his younger sons was already a parent by 1627 James may have been born as early as the 1570s. He married a Harold, a member of another old Limerick mercantile family. While the old Ulf lands must have been retained by the family until at least the time of the first Thomas of the pedigree (circa 1476), described as of Ballyphilip, the local Burke lineage - already exerting pressure on Sir Philip Ulf in 1314 - must have eventually dispossessed the Wolfes here. The latter must have retained some paper title to the lands however, and, in 1611 James Woulfe of Limerick advanced £108 and 12 milch cows of three years of age to Edmund Burke of Garranekishy, and thus regained control of the lands. In 1614 Woulfe bought a quitclaim from Burke's son to establish complete title. Cahirconreiffy (pt. of) Caherconreiffy Anglishcormack 80? While James' sons would play a prominent part in the defence of Catholic Limerick during the religious wars of the Confederate Period the most famous Limerick Woulfe was from an earlier generation. This was Fr. David Woulfe S.J., one of the leaders of the Counter-Reformation in Ireland. This Jesuit was born during the first decades of the 16th century in Limerick City. Both his education and his fosterage by an O'Brien - an ancient Irish custom only practised by the wealthy - indicate his patrician status and he must have been one of the Woulfes of Ballyphilip. He first comes to attention in 1550 when in Rome on a Papal pension. Already a pupil of Ignatius Loyola, the founder of the Jesuits, he was duly ordained and appointed Papal Nuncio to Ireland. By 1560 he was back in Ireland, where he played the important role of papal superintendent of ecclesiastical affairs, essentially the leader of the church, always just one step ahead of the Protestant English, eager for his head. Such was his influence that Queen Elizabeth, when giving her reasons for not attending the Council of Trent, spoke of Woulfe as "having been sent to Ireland from Rome to excite disaffection against her crown". He continued to lead the Catholic effort in Ireland until his betrayal and capture at Carrickfergus in Antrim, in 1567. In 1573, "by great skill and cunning" he escaped imprisonment in Dublin Castle and took ship for Lisbon, where he wrote the treatise for which he is most famous, his "Description of Ireland", commissioned by the Vatican. He was later active in the preparations for the Vatican sponsored invasion of Ireland by the Catholic leader, James fitz Maurice, and is last recorded alive in 1578. Fr. Woulfe signs himself "Dáibhíd de Bhulbh" in 1576, giving us our first record of the later customary form of the surname in Irish as applied to an individual, although the Kildare Woulfe territory was known as Crich Bhulbach as early as 1489. It is most interesting to note, however, that another Woulfe, a Co. Clare scribe and poet, Denis or Donnchadha Woulfe as he usually described himself, who lived in the early 19th century, sometimes signed himself "Donnchadha Ulf", showing that knowledge of the ancient origin of the family was not completely lost. It is hardly surprising to find other branches of the family in Limerick given the centuries old connection with the city. Among members of these may be Nicholas Woulfe, bailiff in 1562, and the others who held this office later, such as Patrick (1585, 1587; perhaps the man of that name who lived in Mungret Lane in 1594), Thomas (1590 - he may have been the leading citizen of that name who occurs in 1608), David (1592), and Pierse, who was removed from office in 1613 for failing to take the Act of Supremacy to the Protestant king. Others who occur were Philip, who witnessed a deed in 1596, and Gaspar, a leading citizen in 1643. One Maria Wolfe was the widow of Oliver Burke, a wealthy merchant of the city who died in 1592. The record of the Cromwellian confiscations after 1653 indicate that there were at least four additional Woulfe propertied families in Limerick apart from the mainline. One of these was represented by the Patrick Woulfe, a city burgess who favoured surrendering the city in 1651, and whose daughter, Katherine, married the Richard Woulfe who forfeited Corbally. There were in fact three Patrick Woulfes in the city at this time for, in addition to Patrick of Corbally there was a Patrick son of Richard Woulfe and a Patrick son of Stephen Woulfe. The second of these owned a cagework house (in modern terms, "tudor style") adjacent to St. Nicholas' Churchyard and valued at £8 while the third Patrick owned a small house and garden valued at £2 at Boherkeagh in the South Liberties of Limerick. Yet another Catholic landowner to forfeit was Nicholas Woulfe, who owned two cagework houses in St. Mary's Parish - one on the High Street, with a combined value of £18. Finally, another forfeiting Catholic was John Woulfe, who lost the lands of Ballynightenmore in the North Liberties from which a small head-rent was payable to the heirs of the old Priory of St. Mary's, yet another connection with the Ulf past, as these very lands may be among those involved in the litigation of 1358 where several Ulfs had obtained portion of the estate of this Priory.